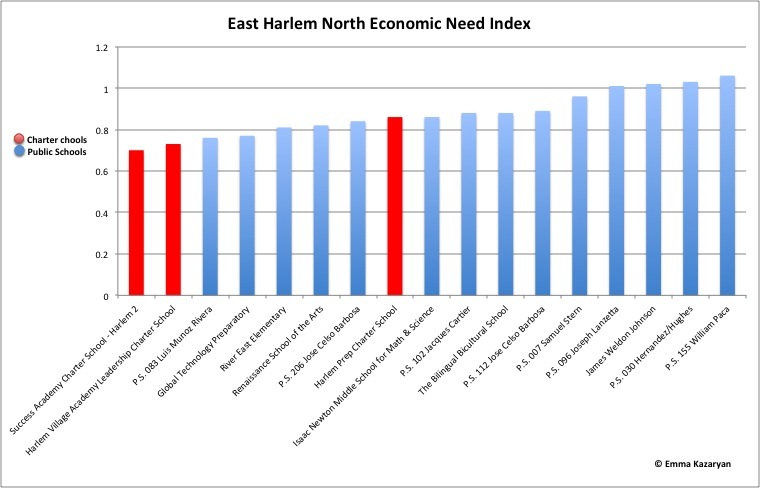 Most of the traditional public schools with relatively low levels of poverty and special needs, including Tag Young Scholars and Manhattan East School for Arts and Academics in East Harlem South, are selective schools. 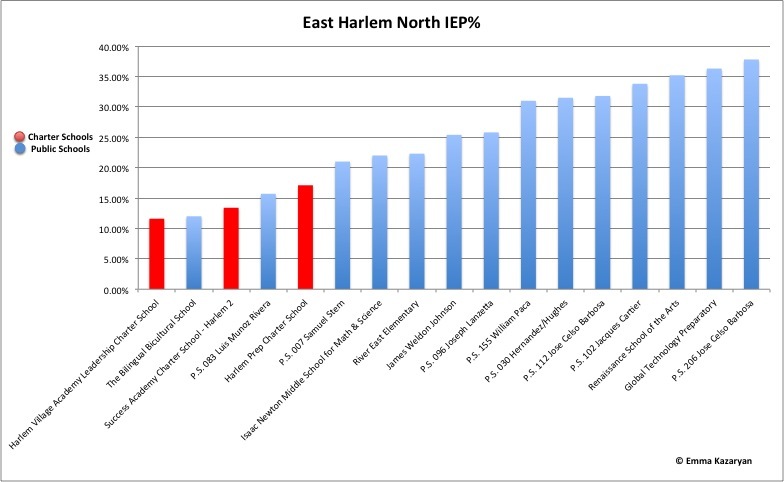 Meanwhile, the disproportionate levels of poverty and special needs, as well as the high percentage of English language learners, at most East Harlem public schools are undoubtedly influenced by the landscape in neighboring Central Harlem where more than half the schools are charters. This entry was posted in Education and tagged Andrew Cuomo, Central Harlem, charter schools, East Harlem, economic need, Education reform, English language learners, Global Technology Preparatory, Governor Cuomo, Harlem, legislation, poor, poverty, public schools, special needs, Success Academy, The New York Times. Bookmark the permalink. Pingback: Technology, Gamification, MOOCs and the Classroom - Mobility Labs, Inc. This data is incomplete. East Harlem Scholars Academy was not included. If it was you would see that some charter schools actually exceed the average local public school percentages of students with IEPs enrolled (at a whopping 30%). Scholars Academy also has about 17% of ELLs enrolled (as measured by state standards) it would be much higher, but due to an intensive ESL program many of these bilingual students test proficient when given the state exam. Scholars Academy actually gives preference in the lottery to students with a native language other than English. To be fair you should report on ALL the local charter schools not just the ones that neatly fit into the point you wanted to make. There are charters schools that work very hard to serve the needs of their neighborhood. Thank you for your comment. 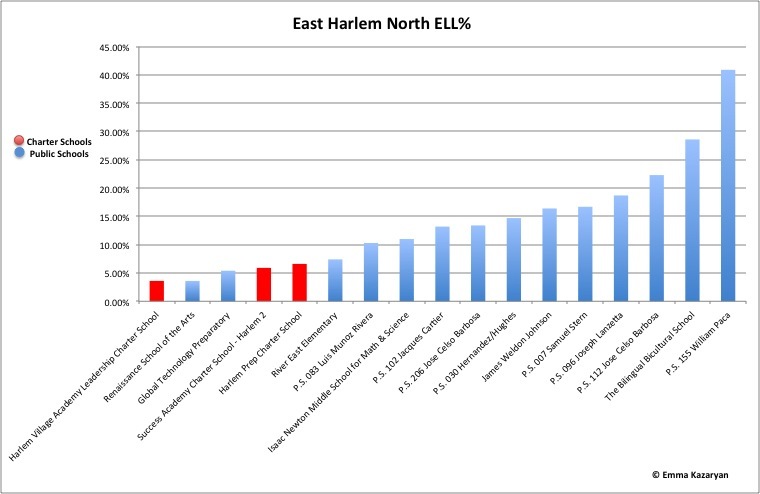 East Harlem Scholars Academy was established in 2011 and does not appear on all the lists posted by the NYCDOE; although you can search for the school by name, it is not included in the list of schools that are listed on the NYCDOE’s neighborhood map–the resource used for the charts in this blog post–nor does it appear on the following list: http://tinyurl.com/kq3q5rh . Also, according to insideschools.org, the school has 16% ELL and 28% special-needs students: http://insideschools.org/elementary/browse/school/1751. The school also only runs to 2nd grade. It is at the end of 3rd grade, just before the 4th grade state tests, that many special-needs students leave charter schools. It will be interesting to see how many special-needs kids remain at East Harlem Scholars Academy once they reach 4th grade. You’re right its not there – its too bad because while I do agree with you that many charter schools do not serve special needs kids, there are always exceptions and East Harlem Scholars Academy is one of them. The school currently serves k-3 and the third graders just finished their first round of state tests (they worked very hard – accommodations and all). I sincerely hope they all remain at the school; the special education coordinator is always working hard to ensure all students have what they need to be successful. And yes, inside schools is correct, the school enrolled 28% special needs students at the beginning of the year, but that number has since gone up as more students obtained IEPs throughout the year. Thank you for taking the time to reply to my comment. There are many conversations to be had about education and I just want there to be a fair view at ALL of the different types of schools out there in our beautiful city. 1) The numbers you cite are exaggerated. 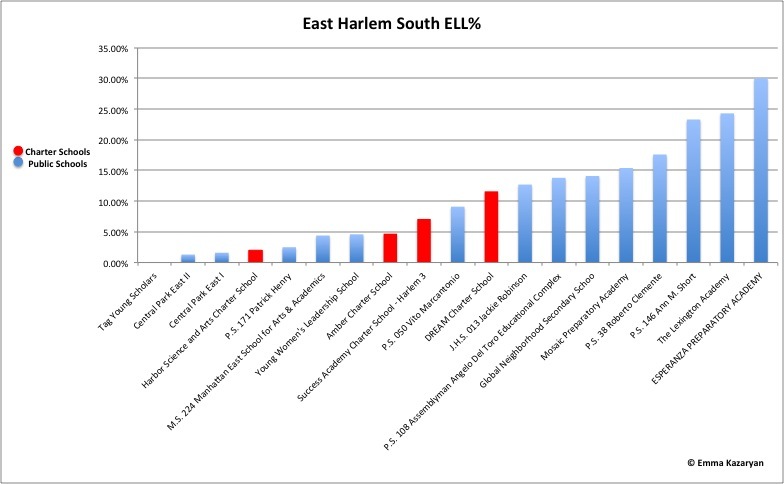 According to the latest data on the New York State Department of Education website http://data.nysed.gov/lists.php?start=69&type=school (presumably a more reliable source than your claims pulled from thin air) East Harlem Scholars Academy enrolled 22% special education students and 12% ELL students. 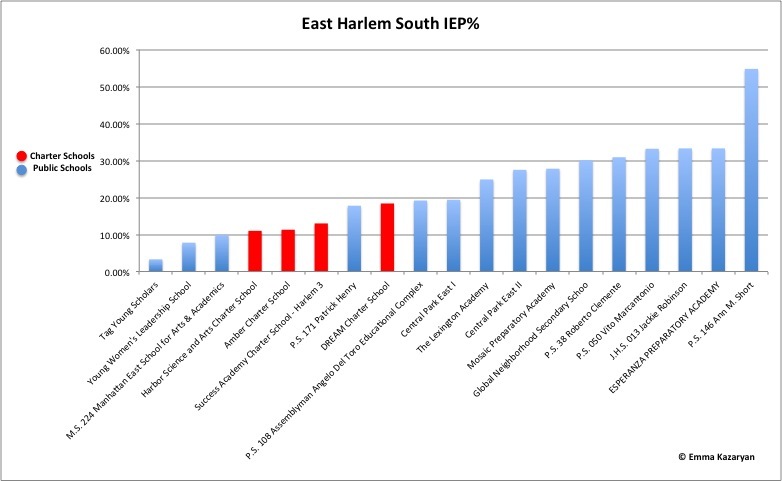 3) The blog post is accurate since the correct numbers place East Harlem Scholars Academy squarely in the bottom of the distribution for % of special needs and english language learner students. What’s worse, even if the numbers you cited were correct, that would put the school only in the middle of the distribution. 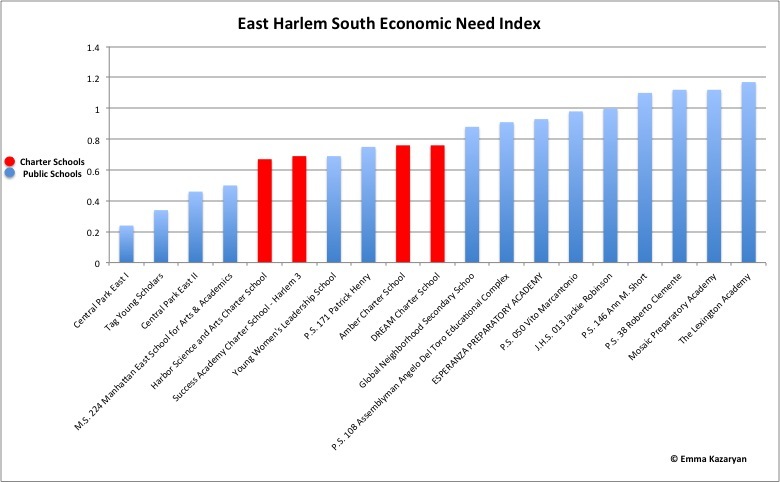 4) You also somehow forgot to mention that according to the New York State Department of Education data East Harlem Scholars Academy has only 46% of its students eligible for free lunch while East Harlem schools as a whole average over 75%. So somehow the school you praise so highly is managing to exclude kids who come from the poorest families. 5) Both these schools are brand new and therefore have no state test data. We know from an Independent Budget Office report http://www.ibo.nyc.ny.us/iboreports/2014attritioncharterpublic.html that charter schools in New York City selectively kick out students with low test scores and special education students. So let’s see what these schools do once they have students in the 4th and 5th grades. Will they keep the special education students and the students who did not do well on the state exams? Or will they do what many charter schools do– which is kick out those students as not being “good fits” for the “school culture?” Only time will tell. 6) In your statements about the school’s ESL program you forgot to mention the incoming levels of the students. Again you show how dishonest you are since you forgot to mention that, according to the New York State Department of Education data, 86% of the kindergarten students test at the advanced level and 14% proficient– before the school has worked its supposed magic. Unlike the public schools in East Harlem, the school you praise somehow manages to only accept english language learners who already know english very, very well. What’s worse 2nd grade students do no better than the kindergarten students since only 11% test proficient. This proves your claim about the school’s results to be pure fiction. In summary, East Harlem Scholar Academy uses all the usual tricks. It excludes the poorest kids, the kids who do not know english, and probably the kids with the highest learning needs. Yet, despite all its advantages, it does no better a job in educating students than public schools. What was it like when you visited these schools?